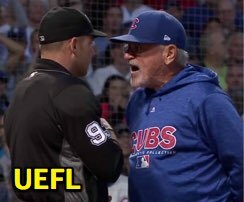 HP Umpire Will Little ejected Cubs 2B Javier Baez and Manager Joe Maddon (check swing strike three call) in the bottom of the 5th inning of the Cardinals-Cubs game. With two out and two on (R1, R2), Baez attempted to check his swing on a 0-2 curveball from Cardinals pitcher John Gant, ruled a swinging third strike by HP Umpire Little, who issued an equipment violation for Baez's bat slam before ejecting Baez for throwing his batting helmet. By rule, an offensive player cannot request an appeal to a base umpire on the plate umpire's original ruling of "strike"; an appeal on the half swing may only be made on a call of "ball" and when asked to appeal (generally by the catcher, but potentially the manager), the plate umpire must refer the appeal to a base umpire. * Play was adjudicated and affirmed by the UEFL Appeals Board (8-0-1), the call was correct. At the time of the ejections, the Cardinals were leading, 1-0. The Cardinals ultimately won the contest, 6-3. These are Will Little (93)'s fourth and fifth ejections of 2018. Will Little now has 3 points in the UEFL Standings (-1 Prev + 2 MLB + 2 Correct Call = 3). *Rule 8.02(c) Comment: "The manager or the catcher may request the plate umpire to ask his partner for help on a half swing when the plate umpire calls the pitch a ball, but not when the pitch is called a strike...Appeals on a half swing may be made only on the call of ball and when asked to appeal, the home plate umpire must refer to a base umpire for his judgment on the half swing." These are the 101st and 102nd ejection reports of the 2018 MLB regular season. This is the 50th player ejection of 2018. Prior to ejection, Baez was 0-3 (SO) in the contest. This is the 42nd Manager ejection of 2018. This is Chicago-NL's 5/6th ejection of 2018, 1st in the NL Central (CHC 6; MIL 4; CIN, PIT 2; STL 1). This is Javier Baez's first career MLB ejection. This is Joe Maddon's first ejection since October 18, 2017 (Mike Winters; QOC = N-C [Foul/K]). This is Will Little's 4th, 5th ejection of 2018, 1st since July 9 (Ned Yost; QOC = N [Balls/Strikes]).